David Monahan (center) was diagnosed with a bladder tumor a week before National Grid locked out union workers. He is scheduled for surgery in a few weeks but isn’t sure how he will pay for it because he lost his work insurance. 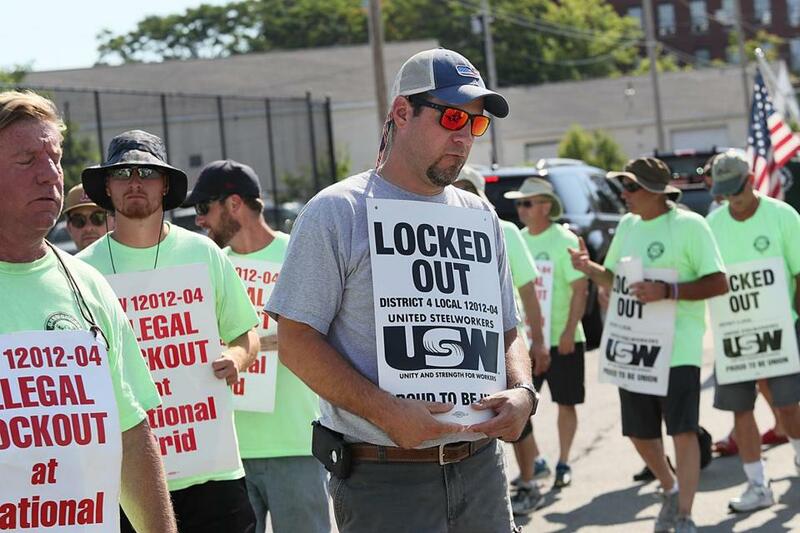 As the lockout at National Grid stretches into its third week, 1,250 out-of-work gas employees around the state are grappling with the loss of income and health insurance following the utility company’s decision to bar employees from working when contract negotiations stalled. One employee in Lowell who just found out he has a cancerous tumor in his bladder is unsure how he’s going to pay for surgery; another worker in Northborough is scrambling to get MassHealth to cover a biopsy for her 9-year-old daughter, who suffers from a rare lung disease. At the same time, the unions representing workers say that safety violations are piling up as contractors and managers fill in for locked-out workers. “They’re trying to pressure people into accepting the final offer,” said John Buonopane, president of United Steel Workers Local 12012, which represents about a third of the locked-out gas workers. The rest belong to United Steel Workers Local 12003. 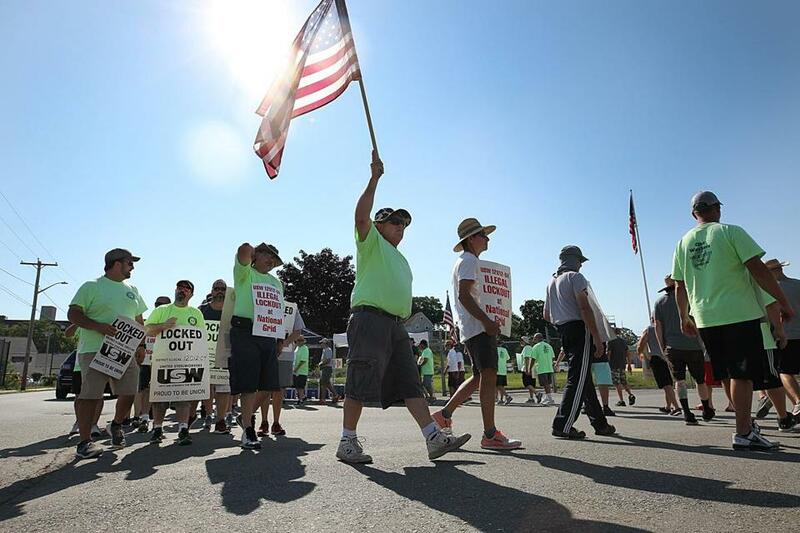 After months of contentious bargaining, the contract expired at midnight on June 24, and National Grid refused to let employees in the next day. The unions had voted to authorize a strike the week before but offered to keep working under the old contract, which contains a no-strike clause. Company spokeswoman Christine Milligan said that with no progress being made, the company rejected the proposal and took preemptive action to ensure service was not interrupted. The union is fighting proposals that would increase health care costs and reduce benefits for new hires, including replacing pensions with 401(k) plans. National Grid noted that similar changes have been made in many of its other unions in New England and across the country. But the local unions are against the changes. About 1,250 National Grid workers are entering their third week of being locked out after contract negotations stalled, with no paychecks or health care coverage. On Tuesday, they picketed at National Grid’s facility on Rock Street in Lowell. When the company halted the workers’ health insurance July 1 as a result of the lockout, entire families lost their coverage, leaving some of them in precarious positions. David Monahan, a 34-year-old service tech in Lowell, was diagnosed with a cancerous tumor in his bladder less than a week before the lockout and is scheduled for surgery at the beginning of August. But in the past week, the hospital has called him several times because “the computer is setting off all sorts of red flags that my insurance is no longer valid,” he said. Monahan, whose wife and 14-month-old daughter are also on his insurance, is looking into purchasing National Grid’s COBRA plan, but the nearly $2,500 a month cost is prohibitive, especially with no income, he said. He’s applying for MassHealth, the state’s Medicaid program, but because his wife works as a per diem occupational therapist — with no access to health care — he doesn’t think he’ll qualify. The union is trying to help Monahan and others with urgent medical needs through its emergency health care plan and can offer some assistance paying bills, but there isn’t enough to go around, said Buonopane, the union president. In May, the union noted, National Grid reported a 24 percent annual increase in profit. The lockout is also causing safety concerns, as less-experienced contractors fill in for long-time workers, Buonopane said. Union members who have been monitoring work sites have reported more than a dozen violations to the Massachusetts Department of Public Utilities. Among them: replacement workers filling valve boxes with sand, which could make emergency shutoff valves inaccessible; tents being erected over excavation sites, which could trap gases and create explosive conditions; and drilling being done directly above a gas main, increasing the risk of puncture. National Grid said it is holding its current workers out in the field to the same standards it always does. The union has also filed a complaint with the National Labor Relations Board claiming the lockout is illegal and is scheduled to provide testimony to the NLRB this week. Unlike in industries such as health care — Tufts Medical Center locked out nurses for four days last summer following a one-day strike — lockouts at utilities are rare, said Thomas Juravich, a labor studies professor at the University of Massachusetts Amherst. And if the labor relations board finds that the company hasn’t been bargaining in good faith, he said, it could be considered a “tainted lockout,” and thus illegal. The next bargaining session, with a federal mediator, is scheduled for July 17. In the meantime, Arlene Jette, a customer service representative at the National Grid call center in Northborough, is trying to figure out how to finance a medical procedure for her 9-year-old daughter. Kaylin. She has a rare lung disease, and a recent scan revealed cysts on her lungs. A biopsy is scheduled for July 24, and Jette is trying to patch together coverage through MassHealth. But the phone calls and paperwork, on top of her concerns about her daughter’s health, have been overwhelming, said Jette, 38, whose 13-year-old son and former husband also rely on her health insurance. Katie Johnston can be reached at katie.johnston@globe.com and on Twitter @ktkjohnston.